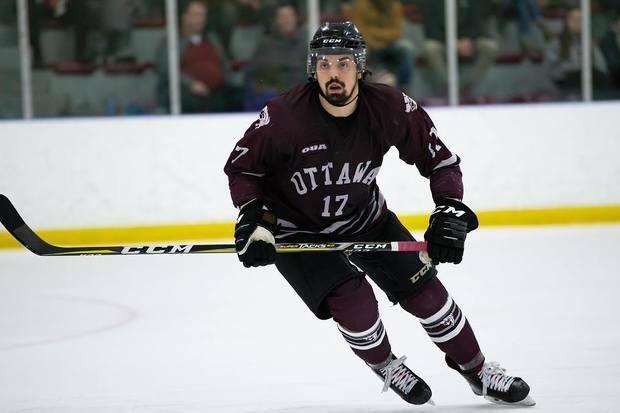 Kevin Domingue is currently a third-year forward on the University of Ottawa (U of O) Gee-Gees men’s hockey team. He was recently named the Gee-Gees’ all-time leading scorer. While growing up in Laval, Quebec, Domingue learned to skate and play hockey on the rink where his dad’s team would have their practices. “It’s a family thing. My family are in sports a lot. I played baseball, soccer, football, and hockey, but when I was young, my dad was coaching hockey, and when he was coaching, I was going out on the ice before the players practice or at the end, so I started by skating at my dad’s team practices,” Domingue said. Prior to his stint with the Gee-Gees, Domingue has had an extensive hockey career in which he has played on the Sherbrooke Phoenix of the Quebec Major Junior Hockey League (QMJHL), the Whitecourt Wolverines of the Alberta Junior Hockey League (AJHL), the Andre-Laurendeau Boomerang of the Quebec CEGEP Hockey League (QCHL), and the Gatineau L’Intrepide and the Laval-Montreal Rousseau Royal of the Quebec Midget AAA (QMAAA). While a part of the Gatineau L’Intrepide in the 2011-12 season, Domingue played in 43 career games while recording 12 goals and 20 assists for 32 points. “I didn’t play for my hometown, I played for Gatineau, so it was my first time away from home, the first time that I was on my own. I learned a lot from that, and it was one of my biggest memories,” Domingue said. 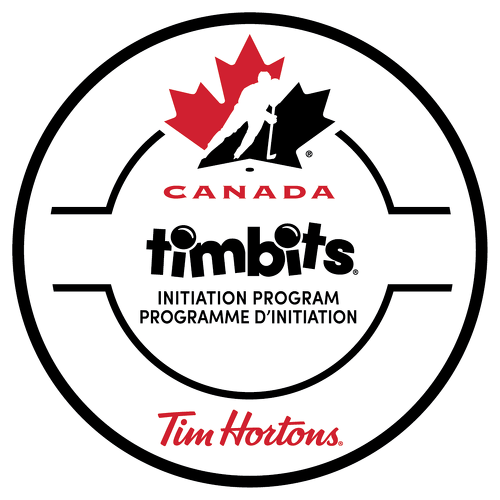 The following year, Domingue joined his hometown Laval-Montreal Rousseau Royal and went on with the team to compete in the Telus Cup, where he and the team took home the bronze medal. While a part of Laval, Domingue played in 54 career games while recording 17 goals and 41 assists for 58 points. “It was something amazing. Because it was with my hometown team, where when I was young the team was my idols, so to win something big like that with them is pretty amazing,” Domingue said. Following his Telus Cup run, Domingue joined the Sherbrooke Phoenix for the tail end of their season, and then eventually ended up playing for the Phoenix until the end of the 2014-15 season. While a part of the Phoenix, Domingue played in 82 career games while recording 14 goals and 7 assists for 21 points. “It was a tough time for me. In that league you have a lot of success or not a lot of success, and I didn’t have a lot of success, but at the same time, the experience of playing in a big league like that where you travel a lot and you play against and with pro athletes, its something that I learned a lot from,” Domingue said. “So, because I didn’t have a lot of success, I had to build from that, so a lot of pros and cons but I also learned a lot and matured a lot with that year, and I still had a lot of fun,” Domingue added. 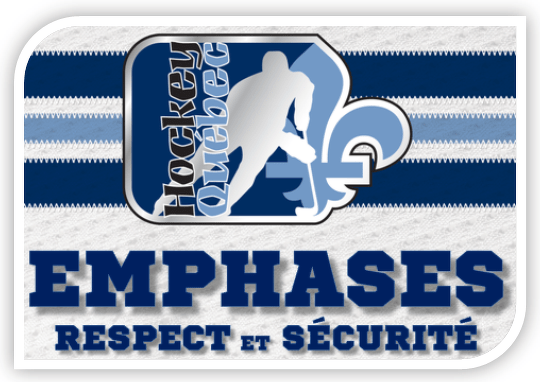 At the beginning of the 2013-14 season, Domingue got cut from Sherbrooke, so he went and played for his CEGEP team. The Andre-Laurendeau Boomerang. 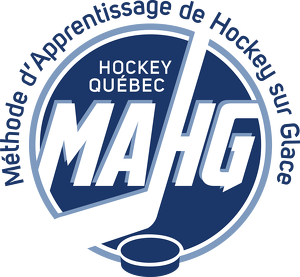 “I had a lot of success on that team, so Sherbrooke called me up to play some games for them, and it was a weird experience because with my CEGEP team I was playing a lot and I had a lot of success, and when I was going to Sherbrooke I was playing less, so it was a learning experience,” Domingue said about his rollercoaster season. “So, when I went to Sherbrooke I had to work harder and show them that they made a mistake to cut me, so it was a tough year, a lot of hard work, but I think it paid off,” Domingue said. Domingue joined the University of Ottawa Gee-Gees in the 2016-17 season, the same year that the men’s hockey program had been reinstated following claims of sexual assault during the 2013-14 season. The rebuilding of a program is what drew him to Ottawa. “It’s always a lot of pride when you rebuild a program and you have success. Long term, its going to come back from that two, three year rebuild where we rebuild a logo, rebuild a brand and that thing really attracted me where we all started from zero,” Domingue said about his decision to join the Gee-Gees. “Everybody that came here started from zero and today in the third year, the group is very close and we have a lot of pride to wear that logo now,” Domingue said. Following his first year on the Gee-Gees, Domingue got named to the Canadian Interuniversity Sports (CIS) and Ontario University Athletics (OUA) East All-Rookie team. “That first year I didn’t have a lot of expectations. I was coming here to rebuild a program. We’re just trying to play hockey and win games, the team itself didn’t have a lot of expectations,” Domingue said. “So, to have an award like that means a lot to me and its something that I take pride in. I couldn’t ask for anything better, so it was a pretty perfect first year,” Domingue said. Like many athletes, Domingue has faced many obstacles and adversities to get him to the player he is today. “As a hockey player you always have ups and downs, and its always how you react from it and how bad you want to have success when you’re in a down. So, for sure, sometimes for two, three straight games you don’t have points or nothing goes in, nothing goes like you want, and its all about how you adapt to that,” Domingue said about the challenges he has faced. While he has faced many challenges on his path to becoming the player he is today, Domingue has also grown on and off the ice because of the challenges. And this growth has made him a stronger hockey player in the long run. “Every time I had downs, how I adapted and reacted to overcome those things, and my family that has supported me on any decision I took,” Domingue said. So far, as part of the Gee-Gees, Domingue has played in 89 career games while recording 56 goals and 43 assists for 99 points. “I think when we finished our first year and made playoffs. We had a great first year and nobody expected that, so I think that makes it better. And we’re building from that, we’re doing better and better every year,” Domingue said. Domingue has had an incredible first three seasons on the Gee-Gees in which he has achieved many accomplishments. Recently, Domingue has become the Gee-Gees’ all-time leading scorer. “You can score as many goals as you want, but at the end of the day any team wants to win playoffs and championships, so, I’m happy about that achievement, but at the end of the day, nobody’s going to remember that,” Domingue said about his achievement. “Everybody’s going to remember if we won playoffs or a championship, so, for improving I will keep doing what I can do best to help my team to get to that achievement,” he added. “He’s a pure goal scorer. He’s not the kind of guy who goes out and scores five goals against the worst team, I mean, he’s come up with some huge goals for us both last year and this year. So, he’s a terrific player, works hard off the ice too, and he’s been a great leader for us on the ice,” teammate Eric Locke said about Domingue’s hockey talent. Domingue said he loves the Gee-Gees and the bond that the group has formed. When he does graduate from his program in a couple of years, he’ll miss the team the most. “The group that we have, the group that has helped build this program that first year, that group that everybody had no expectations, the people that were there since day one,” he said. As for the future regarding his hockey career, Domingue hopes to one day play on a pro team over in Europe. “I want to play hockey until my body can not take it anymore. So hopefully after university I can play somewhere pro if it happens. Hockey is my passion, so I want to stay in the sport,” Domingue said.